As a kid growing up on an island in the Hauraki Gulf I was acutely aware of the complex relationship between land and sea. Exploring new, and often crumbling headlands to jump off, looking for privacy in enclosed beaches, trekking miles to find new fishing spots that wouldn’t snag all our gear, or chasing waves by working out where the best reefs were and which ones would break during subtropical storms. These are just a few past-times that attached me to the coast and it’s active processes. But at the time I was ignorant to the implications of one major geological process that acts at a slightly broader time-scale. It is a process that defines the shape of Auckland, and particularly its coastline. The process is faulting. The 2011 Christchurch Earthquake really caught our attention and highlights the impact fault movements can have on society. Auckland seems far from Christchurch and active tectonism in the South Island, but it is a large city and has one thing that makes it unique: it is a city built upon volcanoes! And we know that volcanoes and faults are related through tectonic processes. Faults provide a connection to deeper parts of the Earth where magma resides and movements within the crust provide a mechanism for momentary space that allows the buoyant magma to rise to the surface. 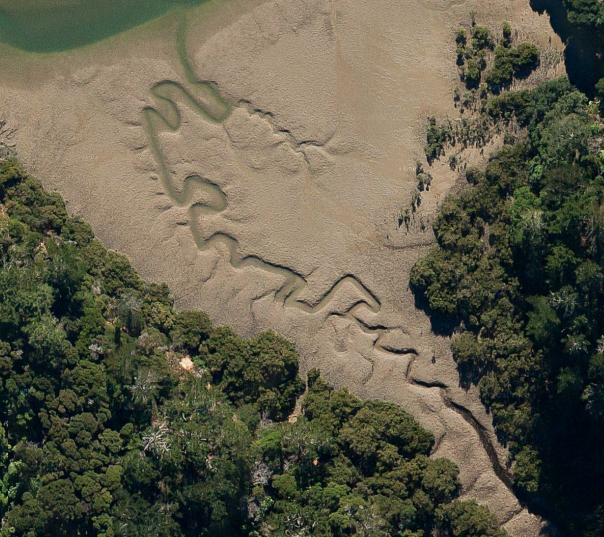 But where are these faults in Auckland? The landforms associated with faulting and volcanic activity (valleys, hills, islands, lakes, swamps, reefs, “quarries”) are intertwined with the everyday experiences of Auckland’s residents and visitors to New Zealand’s biggest city. Most people don’t realise the significance of the land around them, or how it formed. 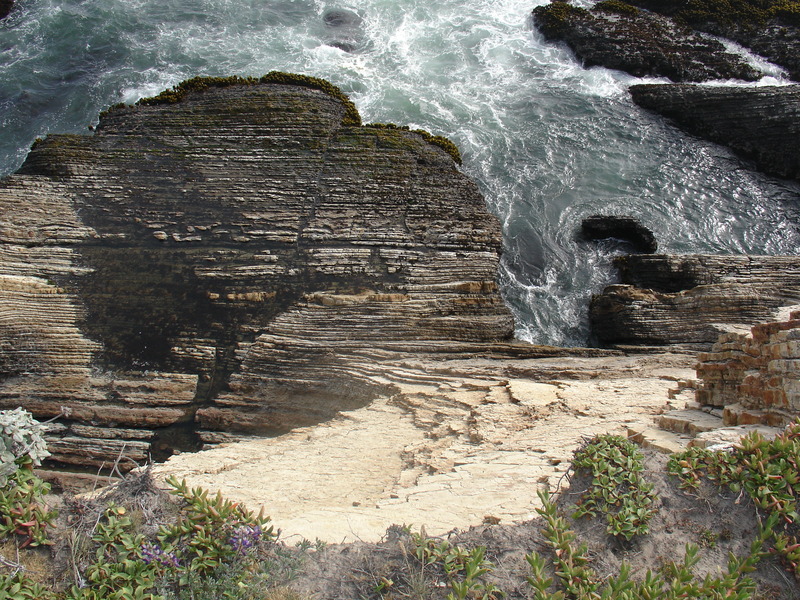 Faults create ridges, valleys and straight segments of coastline. They do this by breaking geology apart to produce weakened, often highly permeable damage zones that promote increased water flow thus accelerating erosion and locally lowering topography. Whereas volcanoes strengthen the landscape by building new hills and infilling valleys through the creation of new rock. Both constitute significant hazards that need to be understood before they can be effectively managed. Currently there is a group of researchers working hard to understand the volcanic hazard potential in Auckland and they have added tremendously to our knowledge. The element of their research that particularly interests me is faulting. Faults play a big role in my interpretation of controls on volcanism in Auckland. In a geologically young volcanic area faults do not only threaten us with seismic hazard (i.e. earthquakes), they also have the potential to influence the location and timing of volcanic eruption. We know from studies of the Earth’s gravity and magnetic fields that the main crustal structure in Auckland trends NNW, parallel to the coastline on the North Shore. This crustal trend defines the boundaries and internal structure of large geological units (called terranes). The terranes are individually named and their evolutions are distinct from one another, but it is generally believed that the sediments and volcanic rocks they comprise were deposited and erupted at or near the continental margin between about 280 and 130 million years ago (Late Permian to Early Cretaceous periods). They became progressively deformed and juxtaposed as their constituent pieces of sea floor became sliced off and accreted to the edge of the Gondwana supercontinent during the mid-Cretaceous. The boundaries that separate each terrane must be inherently deeply-seated faults! When you visit Auckland City you will generally not observe the basement rocks, let alone find evidence for the terrane boundary faults! What’s more obvious are the marine sandstone sequences that dominate coastal exposures in the Waitemata Harbour. These rocks formed when complex tectonic processes caused the basement rocks to subside around 20 million years ago and form a basin into which marine sandstones of the Waitemata Group were deposited. Today these younger sequences form a “blanket” over the basement rocks obscuring any areas where we might expect to find important structures that could tell us something about deep crustal fault movements. But to complicate matters there are even younger rocks and sediments covering the marine sandstones. Over the last few million years (Pliocene and Pleistocene) Auckland’s river valleys and low-lying areas were built up with sediment. 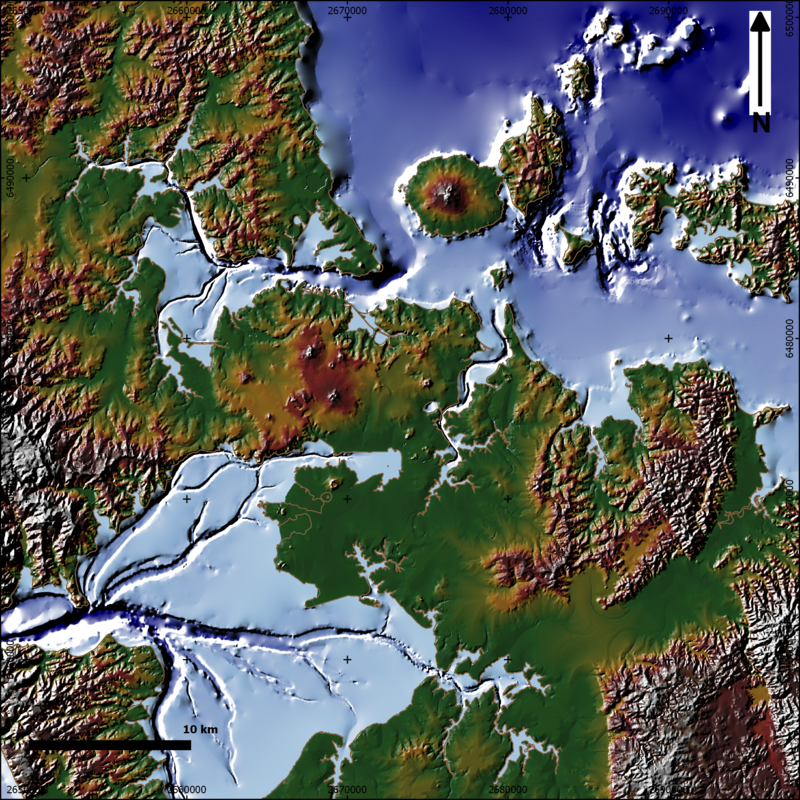 Then, between about 250 thousand years ago and 600 years ago volcanoes erupted producing the current topography of much of central Auckland. So to understand the history of faulting in Auckland, layers of younger geology need to be stripped off to reveal successively older evidence for fault movements. Of course this means that the evidence for the youngest faults will be preserved in the youngest geology at the top of the sequence. Aeromagnetic data (courtesy of J. Eccles – University of Auckland) highlighting positions of volcanoes and some interpreted NE-trending normal faults. Circular magnetic features correspond from west to east with Mt Albert, Mt Richmond, Three Kings and One Tree Hill. Lower amplitude magnetic anomalies consistent with NW-trending lava flows infilling paleotopography. A good way to begin looking at faults is by observing the land surface. Digital Elevation Models (DEM’s) are becoming more and more accessible with general movements for councils and governments to open up their digital data assets to the public. Using Geographic Information Systems (GIS) to construct a map of the elevation in greater Auckland from the DEM there are several obvious NNW-trending topographic breaks in the Hunua Ranges SE of Auckland City. These faults are well-documented as normal faults that have contributed to tilting and block faulting in eastern Auckland, but more significantly they are interpreted to be potentially active. They also appear to correlate with the basement trends I mentioned previously. What is particularly interesting about the blocks of rock in between these faults is that they are segmented by a major NE-trending depression (the Clevedon Valley). If structures such as these clearly deform the basement rocks in eastern Auckland and are potentially active (or at least have a young movement history), then surely there must be some indication of them in the Auckland Urban Area right? Well as I alluded to previously, faults within central Auckland are not particularly obvious. There are many reasons why this is the case, but the real problem is that we are attempting to link the faults to the volcanoes when volcanoes act to hide their underlying structure by covering the surface with lava and the like. A recent study by a University of Auckland researcher has used some clever methodology to remove the blanket of young volcanic rocks and cover materials by analysing the relationships between drillhole geology and the DEM. This study showed that the terrane-parallel faults have a signature in the ancient eroded surface on the Waitemata Group (which has been subsequently infilled), a finding that is of great significance to our understanding of the basement faults. But, unfortunately no definitive relationship has yet been identified between the positions of these faults and the occurrence of volcanic vents. The answer must lie elsewhere. In the opening paragraph I mentioned the complex relationship between land and sea. In Auckland the interface between land and sea is commonly expressed as well-defined coastal shore-platforms. These are defined by exposures of Waitemata Group turbidites and “basement” Waipapa Terrane greywacke in eastern Auckland and on many of the Hauraki Gulf islands. With high-resolution satellite imagery (courtesy of Google) you can investigate this shoreline and construct maps of the geological trends, which allow the positions and orientations of faults to be realised in as much detail as time allows. So if we know the positions and orientations of the faults at the coast, and are able to pick up subtle patterns in the land surface through geomorphological analysis of the DEM, then we can link known faults to interpreted faults allowing their extrapolation into the interior of the volcanic field. With the added benefit of some pre-existing maps I generated a preliminary fault map by following this work-flow. I was then able to compare the fault trends with images of gravity data over the area. This serves to identify which faults may be associated with the basement terranes, which faults cut the basement, and in some cases, which way the faults moved. The resulting map shows some clear trends, the most significant of which is numerous NE-SW trending small displacement faults cutting Central Auckland. Outside the centre this trend is less dominant and mixed with numerous other fault orientations that better reflect the basement fault trends. By adding a temporal component to geological interpretations and models a “story” is constructed. This extra dimension allows complex geological relationships to become more easily digestable, particularly when coupled with good visualisation. This is the kind of study that highlights the significance of understanding fault history, not only for hazard analysis and management, but to gain insight into our landscapes and their relationship with society. This was an enjoyable project. Perhaps you mean that Auckland’s unique because it’s built on active volcanoes. In case it’s been somehow overlooked, Christchurch is built hard up against a rather large volcano. From what I’ve read in the years since the recent quakes, the geological jury is still out on just how this significant puncture in the sedimentary plate affects the local tectonics. Thanks for your comment Joe. The Lyttleton and Akaroa volcanoes certainly feature significantly in the geography of the south Island. Out of interest, trends evident in gravity data, bathymetry data and age relationships show that the Banks Peninsula and the Chatham Rise are tectonically linked. This has been alluded to by other researchers and one of the challenges they face is better understanding how these trends relate to the actively evolving plate margin.